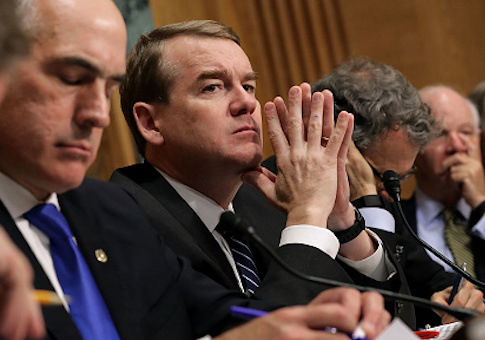 Colorado Senator Michael Bennet is close to jumping in the 2020 presidential race, according to a new report by the Denver Post. Although a longtime adviser to Bennet told the paper that a final decision had not been made, the report said other sources indicated that Bennet "is taking the final steps toward becoming the second Colorado Democrat in the 2020 race," the other being former governor John Hickenlooper. The sources said Bennet is likely to announce in anywhere from one week up to a month. Bennet was appointed to the Senate in 2009, won a full term the following year, and then won reelection in 2016, but has kept a relatively low profile for most of his D.C. career. However, he erupted into the national consciousness about two months ago when a rant on the Senate floor went viral, with the video of the outburst becoming the most-watched C-Span clip that the network posted to Twitter. Since then, Bennet has used the moment as the basis for some social media ads being run in the early voting states of Iowa, New Hampshire, South Carolina, and Nevada. Bennet would be entering a field already crowded by other Democratic senators such as Elizabeth Warren (Mass. ), Cory Booker (N.J.), Kamala Harris (Calif.), Kirsten Gillibrand (N.Y.), Amy Klobuchar (Minn.) and Bernie Sanders (Vt.). Meanwhile, his fellow Colorado competitor took a small swipe at Bennet's level of government experience. "Michael Bennet is one of my favorite people in the world and I think he is a great senator, much better than I ever would be. And if he wants to get into the presidential race, you know, I'm all for it," Hickenlooper said a week ago at the South By Southwest festival in Austin. "Not unlike the other senators, I have a very different history than Michael does. And you know, he has, he is really brilliant at thinking through complex issues, but I don't think he probably has the same level of experience that I do in terms of bringing teams together and actually, you know, getting stuff done. Really moving things forward." Possibly hinting at what his campaign would focus on, Bennet told NBC news in early February that "our lack of economic mobility and the huge income inequality that we have" combined to make the largest problem facing the country. This entry was posted in Politics and tagged 2020 Election, Michael Bennet. Bookmark the permalink.